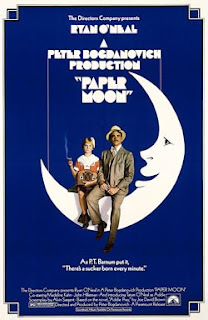 Much of Paper Moon (1973) takes place in Kansas, but the destination of the protagonists is Missouri, this week's state. The film opens with a clergyman; a minister conducting a grave side service for the mother of Addie (eight year old Tatum O'Neil in the Academy's youngest Oscar winning performance). A con man, Moses Pray (Ryan O'Neil, Tatum's father), stops by to pay respects and is persuaded to take the young orphan to her aunt in MO. Pray's go-to con is selling Bibles to widows at a mark-up, and young Addie proves an asset to his credibility. A recurring question in the film is,"What's a con and what's real?" Is Moses perhaps really Addie's father? Is romantic love real? Are the words in the Bibles Moses sells true or as phony as a paper moon? The movie suggests that sometimes we're better off being conned than knowing the truth. Paper Moon was not only partially set in Missouri; those scenes were actually filmed in Missouri (with the city of St. Joseph submitting to a transformation back to the Depression Era). Another period film set in MO is the classic MGM Judy Garland musical, Meet Me in St. Louis, but it was filmed in Hollywood studios. The various versions of Tennessee Williams' The Glass Menagerie were, of course, set in St. Louis, but none were filmed there. Various films based on the work of Mark Twain have been set and filmed in MO, such as the 1973 musical version of Tom Sawyer, but I don't think a great adaptation of any of Mr. Clemens' work has yet been produced. There have been truly great Westerns set and filmed in Missouri (such as The Assassination of Jesse James by the Coward Robert Ford), great comedies (such as Waiting for Guffman), great thrillers (like Gone Girl and Winter's Bone), and at least one great horror film (You'reNext). And when critics argue about the greatest film ever made, non-Missouri films such as Citizen Kane and Rules ofthe Game are bandied about, but surely a work set and filmed in Missouri, the Patrick Swayze classic, Road House, should be a part of that discussion. As we looked for parking for the Cinemark Theater in the Plaza, I worried about what kind of fortune we'd pay for parking; but there was no charge for the garage. Not knowing the ticket prices, I soon discovered two tickets for a matinee cost as much as one ticket in other states. So I'm liking Kansas City, Missouri. The decor of the theater celebrated old time Hollywood, which was a nice lead in to movie we were watching, Hail Caesar by the Coen Brothers. Josh Brolin stars in the film as Eddie Mannix, a studio executive in the Hollywood Golden Age with the job of fixing the messes of the studio's coddled stars. Blessedly for MovieChurches, the film opens with a scene in a Catholic church. Mannix is giving a confession to a priest who seems rather exasperated by the frequency of the exec's appearances. But that's not the end to the clergy in the film. Mannix's studio, Capital Pictures, is producing a film, Hail Caesar: A Tale of the Christ, and a group of clergymen are brought in to evaluate the Biblical and theological accuracy of the film. The rabbi, the reverend and the priests (Orthodox and Catholic) soon seem more interested in the movie business than Biblical truth. The critical reception for the film has been middling, so our expectations were lowered entering the theater. But we were charmed and delighted by this film that celebrates not only the Golden Age of Hollywood, but more surprisingly, and ironically, Jesus.